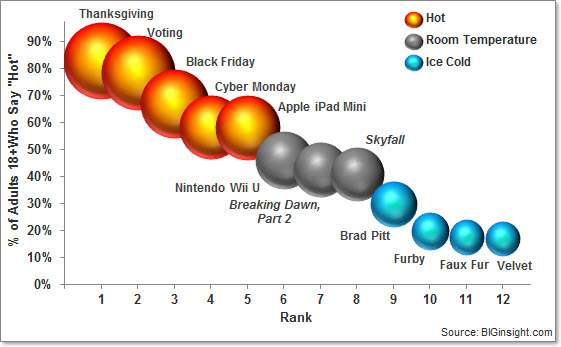 Black Friday and its online equivalent, Cyber Monday, did squeak past some of the season’s “must-have” electronics: the Apple iPad Mini and Nintendo Wii U. The gender split two of November’s biggest box office draws left the overall vote at a near tie: females were in full support of the final Twilight installment, Breaking Dawn, Part 2, while boys of all ages backed the newest James Bond feature, Skyfall. And, despite landing on this holiday’s Top Ten Toy lists for both girls and boys, it appears that Adults 18+ aren’t all that excited about the revamped Furby. But that decision’s ultimately left up to Santa, right? 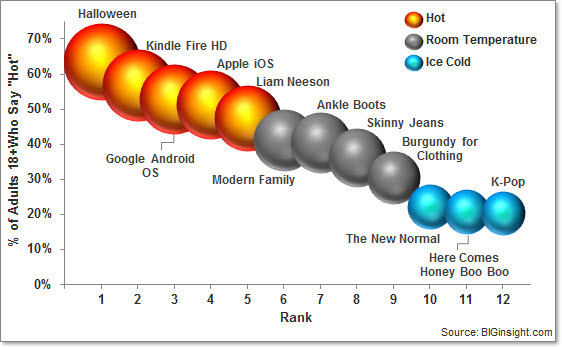 Hot Trends for October: Halloween, Kindle Fire HD…and Honey Boo Boo? With the calendar flipping over to November and the holiday season right around the corner, let’s put official closure on October with a look at our “Hot or Not?” segment from our latest monthly survey. Consumers also still seem pretty Taken with Liam Neeson, and The New Normal is looking pretty cool compared to hot competitor Modern Family. Ankle boots and skinny jeans look like they’ll make a trendy transition from fall to winter this year, particularly among women 18-34. Finally, in what may have renewed my hope in the morality of U.S. consumers: Here Comes Honey Boo Boo was voted little Miss “Not” Hot for October. The “Hot or Not?” segment in our September survey was full of current events, personalities, and [my favorite] fall fashion trends. But what trumped the royal family, fantasy football, and peplum tops? In other news, it appears that Prince Harry’s recent antics in Las Vegas only served to endear him further with Americans at large. The royal, now serving in Afghanistan, bested big bro Prince William in our poll this month. Lance Armstrong – with his own “Did he? / Didn’t he?” doping drama – found himself in an unfamiliar position toward the end of the pack this month. With half the population – i.e. 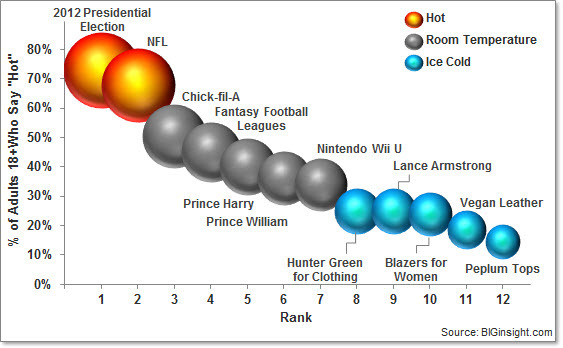 men – finding little to get excited about here, fashion trends typically find themselves in “ice cold” territory. However, it does look like ladies’ best bets for fall are entrenched in the more preppy territory with hunter green and blazers topping vegan leather and peplum tops. I’m grateful, though, that women under 35 are more psyched about the faux leather movement: while my husband recently gave my leather-like coated denim a big thumbs down [the term “80s groupie” was used], this is a trend I’m planning to stick with…anything to keep you young, right?